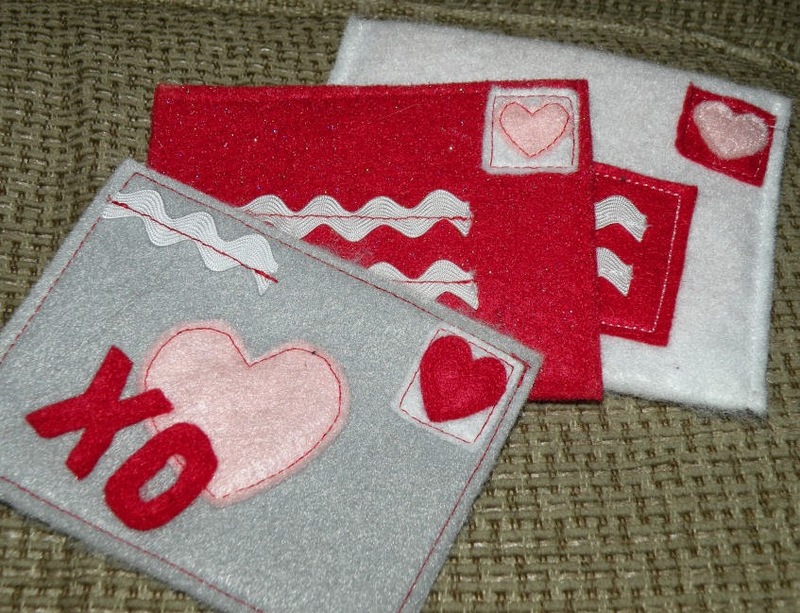 Many thanks to Lu Bird Baby for her lovely felt Valentines and tutorial on making felt mail. 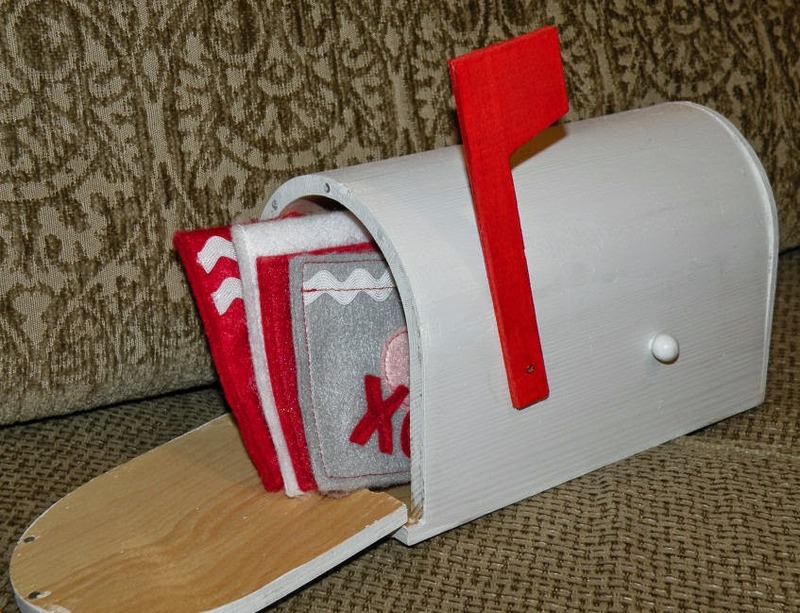 As I mentioned yesterday, I picked up an unfinished wooden mailbox at JoAnn and some sheets of felt in red, white, pink, and grey. Miss M would have been perfectly happy to play with the mailbox just as it was, but I thought it needed a bit of sprucing up. I was a bit short on white acrylic paint, so it could use a second coat, but as long as you don't look too closely, it is nice. 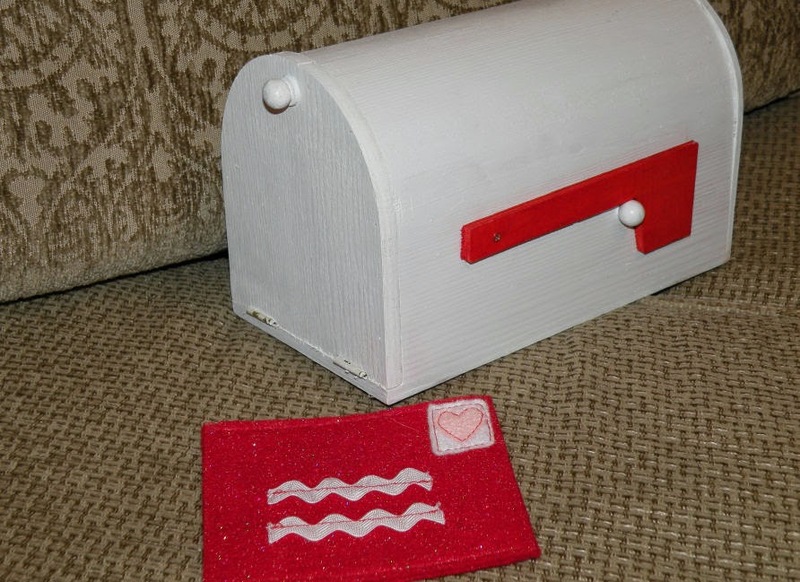 Miss M was also perfectly happy pilfering used envelopes as I paid the bills, but I wanted to try my hand at felt mail. I'm so glad I did. They turned out so cute and Miss M was delighted to have "my own, my very own mail, Mama!" She has been delivering and checking the mail all day long. For anyone who's thinking about making mail for their own kids, I find Miss M doesn't have much trouble at all putting the "letters" in the envelopes, but she is exceptionally dexterous for her age (3 years, 3 months), so if you're crafting for kids this age or younger, stick to the postcards unless you want to be stuffing envelopes all day! I made a bit more progress on the indoor hopscotch I started before last week's hospitalization. It took me a while to figure out where my mother-in-law stashed the pieces since she "cleaned up" while staying here with the kids. I know she meant well, but it is really not at all helpful to put things "away" where they don't belong so that they cannot be found. A week later and I'm still opening my cupboards to get something out or put something away and encountering 2-3 objects out of place that have to be dealt with before I'm able to complete the task I was attempting in the first place. *sigh* She lived here for 10 months, you'd think she'd know where I keep things. It's not like I've changed anything since then! Oh well, I'm just thankful to have my house to myself again!! Love, love, love the felt mail!! I also love Lu Bird Baby! Thanks for commenting on my blog today. I'm glad to find your blog too! I wanted to comment about your intro on the side......I had never heard the term, "Pushing Up Daisies", until I met my husband. There is a song by Kevin Welch called, Pushing up Daisies and my husband played it for me when we were dating. You know, one of those deep dating discussions we all use to have. Ha, ha. I kind of like the phrase and it puts a smile on my face. Glad to "meet" you! I too like the phrase. Despite its being about death, it has the feel of renewal and a fresh start. Lots of things in life are that way...sadness about ending, hope and anticipation for a new beginning. Especially with our kids because as they grow we're sorry to see phases go, but excited about the growth and changes in them.